From 1873 to 1954, the southwest corner of Williams & Brink Streets was occupied by the Methodist-Episcopal Church (M-E Church). When the church was first built, the south block of Williams Street and half of the north block were primarily filled with houses. Very few commercial buildings were on Williams Street, and those were located closer to the train depot. The M-E Church was extensively remodeled twice during the 80 years the building was in use. During this time, Williams Street was transformed from a street filled with houses to a street filled with businesses. 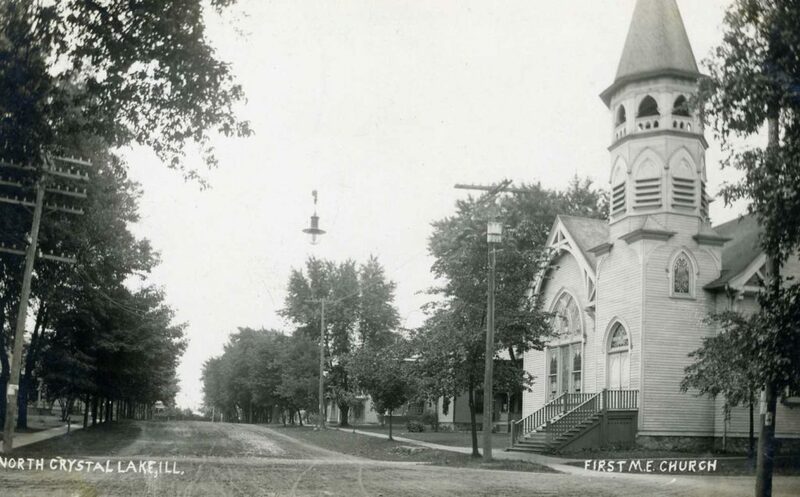 As Crystal Lake grew, the Methodist congregation outgrew the little church. By the early 1950’s plans were made for a move away from the business district as six acres of land was purchased on Crystal Lake Avenue & Dole. 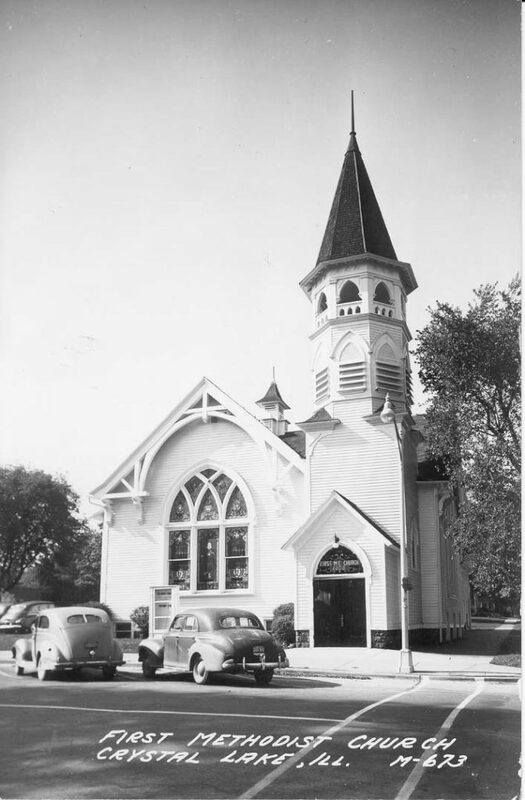 The last church service held at the old church was on October 17, 1954. The property was purchased by Lester Gieseke. Mr. Gieseke offered to give the church building to any individual or organization if they would just move it off the site. Estimates at the time indicate it would have only cost someone about $5,000 to move the building. But there were no takers. The pretty little church was demolished to make way for a grocery store. Prior to demolition, some of the stained glass windows, the bell, and a few of the pipes from the organ from the old church were saved and incorporated into the new church building.